Description - Our Portable Event Flooring is the perfect modular event flooring for any event - indoors or out! These easy to install tiles are incredibly durable, and can be used as a temporary floor option and reused again. Portable Event Floor tiles are available in an option with drainage and ventilation holes for use over natural grass, allowing for the grass to receive light and continue to grow. Portable Event Flooring also has a version with a smooth, uniform anti slip surface that can be used over synthetic turf and prevents liquids from passing through the floor to the surface below. Both of these options can be easily installed without any training or special tools and can also be broken down into sheets rolled up for storage in between scheduled events. Size - Each 12" x 12" section is made up of 3 connecting modules that are each 4" x 12". Recommended Uses - This flooring is recommended for use anywhere that a portable and reusable event flooring surface would be needed. These tiles can be used as flooring for special events such as weddings, graduations, concerts, conferences, car shows, and many other types of gatherings where a durable floor is needed. EventDeck is designed to be installed over grass, gravel, sand, dirt, and mud. 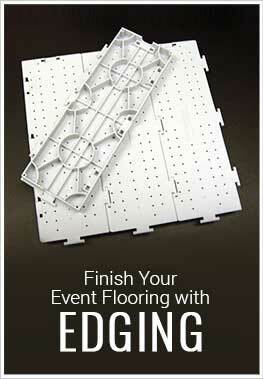 Easy, snap together event flooring system that is weather resistant, UV stable, and affordable. Features hidden cable channels for cables to be hidden discreetly beneath the tiles. Safety edging is available for rolling carts, wheelchair access, and rolling equipment loads. Affordable and durable event flooring that is portable and reusable. Can handle the weight of cars, trucks and forklifts. Great for use at concerts, weddings, in tents, as athletic field protection, a walkway, and more.